X marks the spot on your treasure map; bet all your doubloons on a buccaneer costume that will make you walk and talk like a pirate of centuries past. Regardless of the day’s agenda of pillaging and plundering for gold and precious stone or just having a taste o’ rum, you will look commanding and down right swashbuckling in a buccaneer costume. With a fine sense of fashion and finery, buccaneers were even know to steal the expensive damasks, silks and laces being transported on board the ship under siege. Captain Jack Sparrow from Disney’s “Pirates of the Caribbean” series has perhaps the most popular buccaneer costume in recent times. Add to his stylish top coat, lace jabot and canvas breeches with the scarf-topped dreadlock wig for a complete buccaneer costume look. 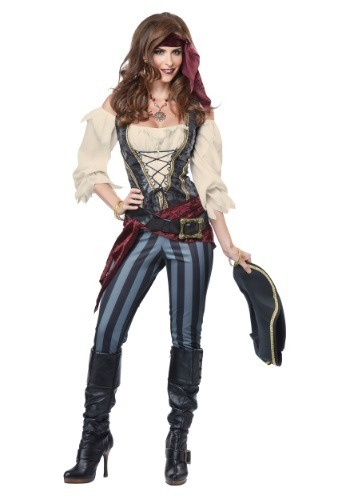 Whether you’re creating a ruckus in port with your favorite wench or swashbuckling aboard ship, a pirate or buccaneer costume and tricorne pirate hat will keep you swaggering in style. 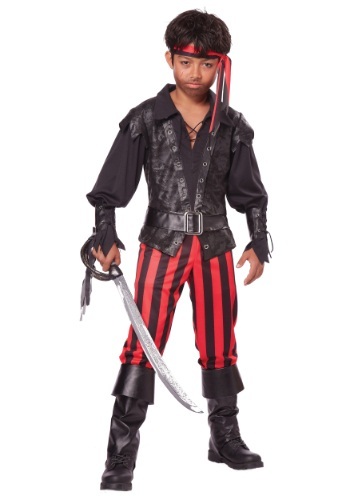 Another buccaneer costume idea is to try your hand (er, hook) as the dexterously challenged pirate villain from Peter Pan, Captain Hook.